Dyscalculia is an impairment of mathematical development, a disorder where an individual experiences difficulty learning basic math facts and skills. People with dyscalculia find great difficulty in remembering the basic math functions such as addition, subtraction, multiplication, and division, or even processing some mathematical concepts, such as magnitude. Are you bad at math, or do you have #dyscalculia? This video discusses the nature of dyscalculia, and some of the frustrations they may face. For many, each time they try to compute a quantity, it's like reading a new foreign language. People with dyscalculia require help and assistance, depending on the severity of the degree of the dyscalculia. But no matter what, there are plenty of options to help, and anyone with dyscalculia can still succeed. Dyscalculia is a specific learning disorder that is characterized by impairments in learning basic arithmetic facts processing numerical magnitude and performing accurate and fluent calculations. People with dyscalculia struggle with math skills. It can hinder students' ability to make progress, and those students will definitely need assistance. Students with dyscalculia can still be successful. 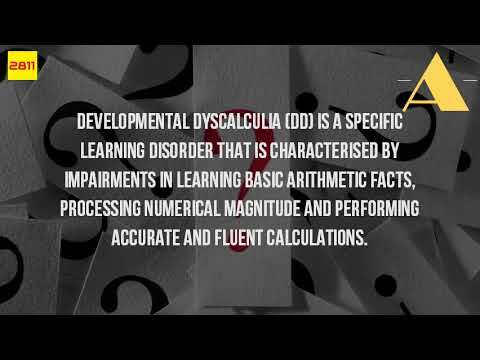 Video of What Are The Symptoms Of Dyscalculia?